Google Chrome Beta V6 Released-What’s New Feature? Google chrome browser yesterday announced new beta version with few improvements and adding some new features to it. In new Google Chrome 6.0.472.33 beta, they have improved in speed compared to other beta release as per the official announcement. Also, this time they changed few design look in Chrome browser and added “Auto Fill” feature in this beta version. Other than the above two points there is no big changes in this version. Here is a video about explaining the new Autofill feature in Google Chrome 6.0 beta version explained by A Google software engineer. 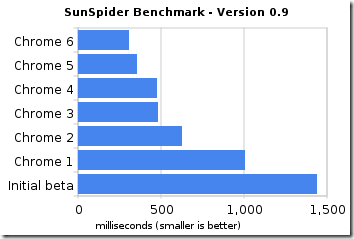 Here is the improvement of speed test compared to older beta versions of Google Chrome. Here is a small design change made in Chrome V8 Beta. If you interested in testing beta version, then you can download latest Google Chrome beta version here. The new change is very useful one.I use Google Chrome for forex trading. Very fast browser. I’m using Chrome for browsing now a days. When I need extra options, then I switch to Firefox.